*Cadets MUST wear their uniform and be accompanied by 1 x full paying adult. All adults and cadets must have a ticket to enter the event. Simply enter the promotional code when purchasing tickets. To find out the promotional code contact your County HQ or ACFA. Beating Retreat by the Household Division is a spectacular display of music and pageantry by the Massed Bands of the seven regiments which form the Household Division. 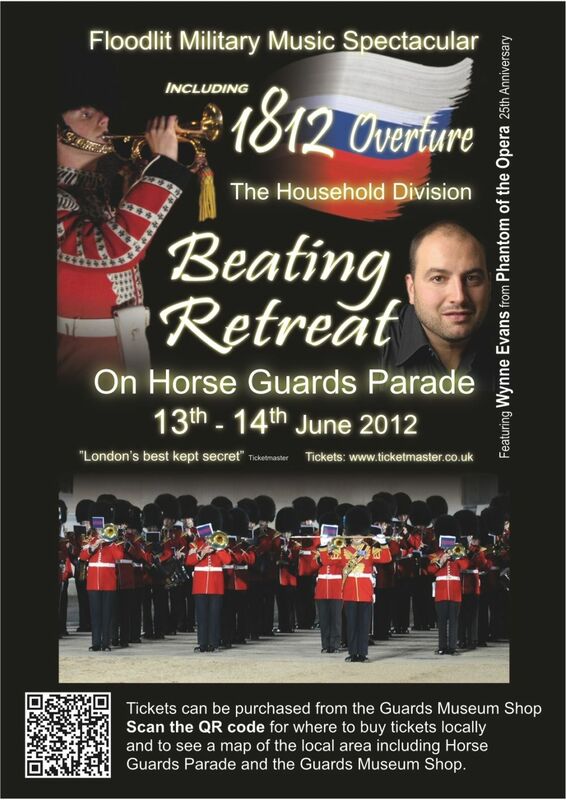 The event will commence at 9.00 pm on 13th/14th June and will feature an hour-long display of non-stop music under floodlights in the historic setting of Horse Guards Parade. The ceremony is steeped in history but is now a far cry from its origins when a Drummer would beat a signal to mark the end of a soldier’s working day. The Mounted Bands of the Household Cavalry will play music from the award-winning film War Horse, with an appearance from one of the show’s horse puppets. The thirtieth anniversary of the liberation of the Falkland Islands will be marked by the Pipes joining the bands in a march composed on the slopes of Mount Tumbledown in the days immediately following the battle. An unusual addition this year will be the first appearance in London of the Mounted Band and Musical Ride from the Royal Cavalry of Oman. The stirring sight and sound of the Massed Bands of the Foot Guards forms the backbone of the evening and they will play Fanfare for the Common Man, and then slow march to the dark and sinister tones of Prokofiev’s Montagues and Capulets before breaking into traditional parade marches. The Senior Director of Music, Lieutenant Colonel Stephen Barnwell, will then conduct the Massed Bands in a performance of Tchaikowsky’s 1812 Overture, incorporating the Guns of The King’s Troop, Royal Horse Artillery, the muskets of the Moscow Militia and fireworks. To end the evening, all troops will assemble to Handel’s See the Conquering Hero Comes and the bands will accompany opera singer Wynne Evans in the hit song Time to Say Goodbye, joined by the pipes for the final chorus.